Among the dwindling band of deluded wind and sun worshippers, no two words are more prone to send them into apoplexy than ‘South Australia’. Held up as the example of how to run an economy on sunshine and breezes (sprinkled with a liberal dose of pixie dust and batteries that cost $150 million to power SA for four minutes when the wind stops blowing), its rocketing retail power prices and rickety grid (SA experienced even more grid failures in the last week) offer the perfect retort to renewable energy zealots, and the rent-seekers who depend upon them as ‘useful idiots’. 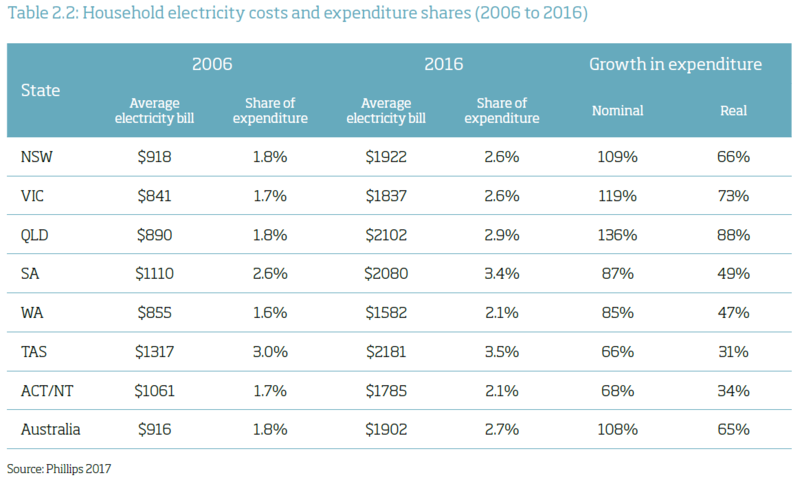 South Australia’s vapid Premier, Jay Weatherill recently ran a top-class fake news story that South Australia’s power was now the cheapest in the nation (see below). Try telling that to the householders and businesses who already pay the highest power prices in the world (see above). And who can only expect power prices to double again before their very eyes. Dishing up hard numbers to renewable energy zealots is like telling five-year-olds that Father Christmas is just a clever marketing ploy. It turns out that the reality of Weatherill’s claim to have slashed power prices with his mega-battery and diesel-fuelled jet engines is just as spongy as expecting a fat bloke to squeeze down your chimney, without soiling his red suit. As Jay Weatherill reveals his “next wave” of renewable energy projects in South Australia ahead of tomorrow’s commissioning of the world’s largest lithium-ion battery, new data conflicts with his claim of delivering the nation’s lowest prices. The Weatherill government has repeatedly claimed in recent weeks that South Australia’s electricity prices are lower than other states, thanks to the Premier’s go-it-alone $550 million energy plan. A fortnight ago, the Premier said wholesale prices in South Australia were “the lowest of the eastern seaboard states”, yet Australian Stock Exchange data released yesterday shows South Australia is producing the highest power prices in the National Electricity Market. ASX 2017-18 summer contract electricity prices for the NEM show that for the March 2018 quarter, the price was $173.25 a megawatt-hour in South Australia, compared with $145.50/MWh in Victoria; $108.30/MWh in NSW and $99.50/MWh in Queensland. South Australia, which has an almost 50 per cent renewable energy mix, has been scrambling to find a way to bolster its fragile power grid since the statewide blackout in September 2016 and load-shedding events. The government’s energy plan includes the installation of the world’s largest lithium-ion battery at Jamestown in the state’s mid-north to offer back-up power and to help stabilise the electricity grid. Mr Weatherill is tomorrow due to launch the 100MW battery completed by Elon Musk’s Tesla company. Yesterday, he said South Australia could soon have more battery storage, hydrogen electricity and thermal power as the state continued its move towards renewables. Four companies will receive grants ranging from $1m to $3.6m as part of the state government’s $150m renewable energy fund. Adelaide-based battery firm 1414 Degrees won $1.6m for a proposal to store energy produced from sewage. 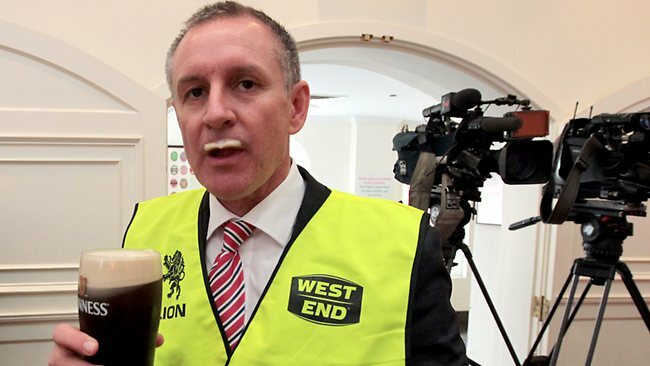 Jay Weatherill is clearly adept at squandering other people’s money, and will go down in history as the man who destroyed the South Australian economy, once and for all. 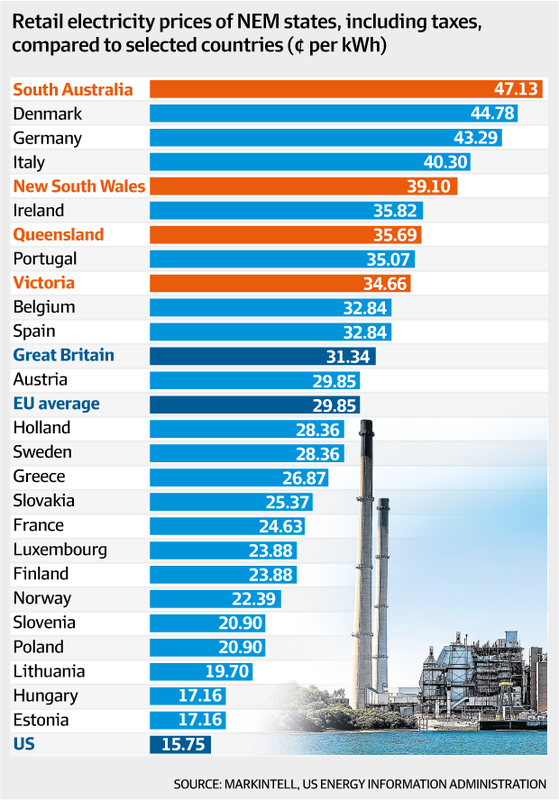 Not only do South Australian power consumers pay the highest prices in the nation, they pay the highest prices in the world (see above). And the reason is pretty clear: a grid dominated by weather-dependant wind and solar. Before we set out some of the key facts and critical findings, here’s The Australian with a primer on Tony Shepherd’s report. Subsidies for renewable energy are behind most power price increases, adding almost $300 to the average electricity bill, according to a report that calls for a “reboot” of the national energy market. Federal Energy Minister Josh Frydenberg will today release the Menzies Research Centre report, which calls for subsidies for renewable energy to be phased out and gas-extraction bans to be lifted to prevent prices rising higher. 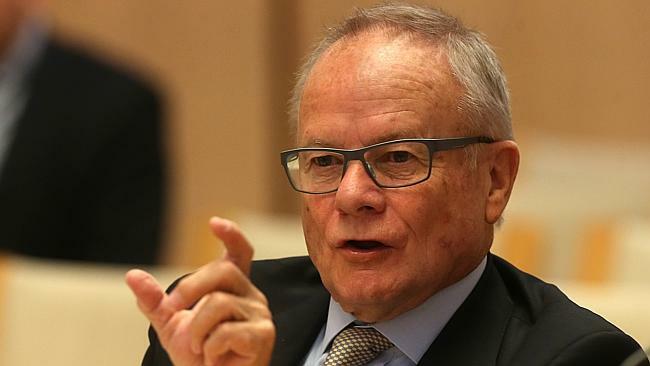 The report, chaired by former Business Council of Australia head Tony Shepherd, also recommends the federal government revive community discussions on nuclear energy, and scrap state-based renewable energy targets in favour of a ­national framework. 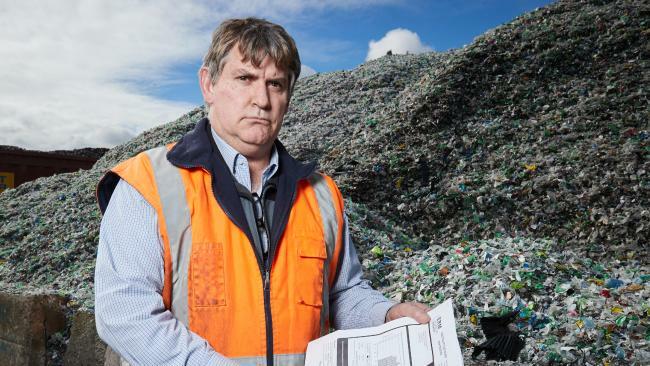 Mr Shepherd said consumers had borne the cost of “ill-judged” state and federal renewable energy programs, which had resulted in a less-efficient, less-reliable national electricity supply. The report saves its most scathing comments for the role state and federal governments played in the lead-up to South Australia’s statewide blackout last year. “Failures in the energy market that led to the first statewide blackout for more than half a century were entirely caused by ill-judged state, territory and federal government policies,” Mr Shepherd said. He said consumers and businesses were not warned about the technical challenge of trying to integrate large amounts of non-synchronous energy generation into the grid. “Nor were they told about the high cost of sourcing reliable energy when wind and solar generators are idle,” he added. The report comes as federal and state politicians grapple with the prospect of rising electricity costs and the threat of blackouts over summer as the national grid reaches peak demand with reduced baseload power following coal-fired power plant closures in Victoria and South Australia. It also comes as state energy ministers investigate a national energy guarantee. The new policy proposes to strike a balance between conventional energy sources and newer, renewable energy sources that may carry higher operating or production costs. The Menzies report argues in favour of a national energy guarantee, which it says is more likely to succeed than policies such as the Renewable Energy Target, because it takes affordability and reliability into consideration, alongside emissions targets. The Australian Competition and Consumer Commission found in October that consumer electricity prices had risen by 63 per cent on top of inflation since 2007-08, prompting chairman Rod Sims to warn that households were under “un­acceptable pressure”. He found higher network costs had driven power price increases in all states except South Australia, where heavy reliance on renewable energy and diesel generators operating alongside the established grid had lifted generation costs. Tony Shepherd: points the finger at the obvious villains. Tony Shepherd’s report, linked above, is probably the most detailed and comprehensive review of Australia’s self-inflicted renewable energy disaster that STT has read. For those wishing to get a handle on the consequences of Australia’s Large-Scale RET and the grid instability and rocketing retail power prices it has inevitably caused, we can only commend it. Here’s Tony Shepherd’s Press Release, in full. In March 2017 the Shepherd Review published its Statement of National Challenges setting out the priorities for national reform. Since then we have conducted a series of community forums talking to people in every state to discover what they think needs fixing. The spiralling cost of energy was the most frequently made complaint in every state except Western Australia. Concerns about the reliability were a close second. One woman in Whyalla, South Australia, told us she used to shop for groceries once a month. Now she shops twice a week because she cannot rely on her electric freezer. Energy prices was the number one complaint by small business owners. We learned that fast food franchises are particularly affected. If you’re serving burgers on demand, you cannot turn off the grill. In Port Augusta, we found a pub running on newly installed diesel generators within sight of the decommissioned Northern Power Station. Consumers and business owners have a right to feel angry. As our report shows, they have been largely kept in the dark about the extent and effect of subsidies to support the introduction of renewable energy. It was never made clear that the cost of those subsidies would be added to their bill. They were not warned about the technical challenge that comes from trying to integrate large amounts of non-synchronous energy generation into the grid. Nor were they told about the high cost of sourcing reliable energy when wind and solar generators are idle. It is clear from our report that the energy crisis afflicting Australia is a problem entirely of government making. It is arguably the most costly failure of government in our lifetimes. Fixing this mess will not be easy. It requires a focussed response from Commonwealth, state and territory governments focussed on the national interest. Most of all, it requires that the market should be left to balance supply and demand and to pass on the benefits of Australia’s abundant sources of energy. The cost of inefficiency in the energy market flows through to every sector of the economy. It affects our prosperity, health and employment opportunities. An inefficient energy market puts a handbrake on the economy and limits the life chances of future generations. It is in every Australian’s interest, therefore, to ensure that the market operates smoothly. Reliable and affordable energy are non-negotiable. Without them, Australians and the businesses they run will struggle to get ahead. STT extracts and sets out below some of Tony Shepherd’s key facts and findings. The effective subsidisation of renewable energy subsidies began in 2001 with the introduction of a 9,500GWh (or 2%) Mandatory Renewable Energy Target (MRET). An Expanded Renewable Energy Target was introduced in 2009, increasing the mandated contribution of renewable energy to 41,000 GWh (or 20%) by 2020. This mechanism was to remain in place until 2030. In 2015, the RET target was reduced to 33,000 GWh/y. This was in response to reduced overall demand, which meant that by 2020 the original target would require a reduction of substantially more than 20%. A number of state renewable energy targets were adopted in parallel with the RET. A carbon pricing scheme became effective on 1 July 2012 at $23/t CO2, increasing to $24.15 the following year. The scheme was revoked on 1 July 2014. Subsidies to renewable energy have been estimated at almost $3 billion in 2016, for 17,500 GWh of energy. The subsidies were on top of the NEM’s revenue, which was $12.6 billion in 2016 for 191,000 GWh; this was up from $8.7 billion in 2015 for the same annual energy supply. Wholesale revenue for the first three quarters of 2017 totalled over $16 billion for 144,000 GWh. The NEM is on track for a revenue total exceeding $21 billion in 2017, almost 2.5 times the 2015 value. On 17 October 2017, the Federal Government announced that it would accept the Energy Security Board (ESB) advice on the National Energy Guarantee (NEG).12 The advice included a recommendation that the existing RET run its course. The current scheme would end in 2030, as provided for in the legislation. The Renewable Energy Target was introduced with little consideration of the additional implications of increasing dependence on intermittent renewable technologies. Renewable energy policies were driven by climate change policy. The issue was how to choose the least costly climate change solution. Initially, costs were managed through a lower commitment to renewable energy sources. However, reliance on renewable energy gradually increased, with little consideration of how this impacted energy reliability and security. Under the RET, government mandates energy subsidies. However, the subsidies are collected from electricity customers and are paid to large and small generators by third parties (electricity retailers). The subsidies do not appear in government accounts and are not transparent. Figure 2.1 shows the estimated subsidies paid by electricity customers to large-scale (mainly wind) generators and households with Solar PV installations under the LRET and SRES components of the RET. In today’s dollars, electricity consumers paid almost $15 billion from 2003–04 to 2016–17. These costs are expected to increase substantially. In 2016–17, well over $2.7 billion in subsidies were paid. This included over $2 billion to achieve the 2016–17 LRET target of 23,731 GWh. Moreover, under current policy settings, the LRET target will increase to 33,000 GWH by the end of 2020 and remain at that level until 2030. The RET has a series of negative flow-on effects for the NEM, accounting for the significantly diminished power reliability observed today. When the LRET was initially expanded in 2009, the NEM had a surplus of installed (thermal) generation capacity. 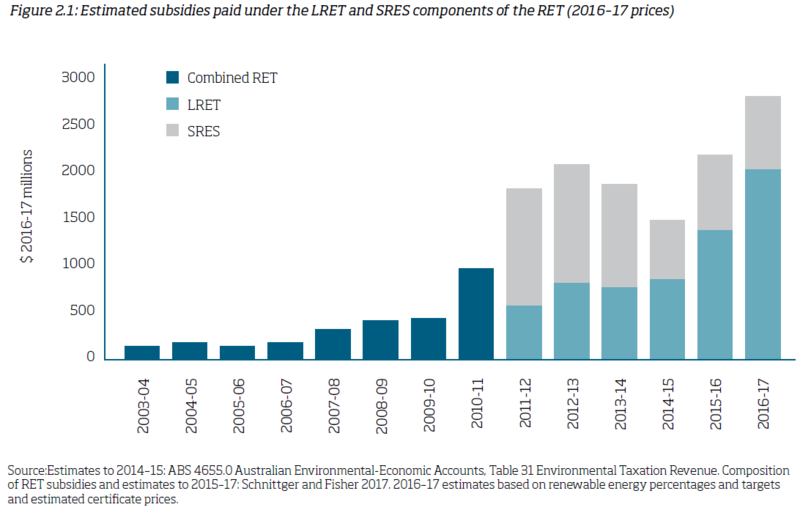 LRET subsidies drove the commissioning of significant numbers of new wind farms, predominantly in South Australia but also in Victoria and New South Wales. The entry of subsidised wind generation to an already oversupplied market had marked effects on NEM spot prices. Firstly, prices were depressed, as the LRET increased the supply of (renewable) generation far beyond what would be economic at prevailing prices. Secondly, wind farms offered their output at zero or negative prices, given that they earn certificate revenues irrespective of market prices and have zero fuel costs. In circumstances where negative price bids from wind farms set the market-clearing price, thermal generators must pay the market operator if they are to remain online. They may be willing to do so for a limited number of hours to avoid shut-down and startup costs. The consequences of successive plant closures are twofold. Firstly, the system has become increasingly fragile. This is because conventional generators provide a number of ‘ancillary services’ that are crucial for keeping the power system stable and lights on. Wind and solar farms cannot provide these services, so concerns about power stability and reliability will only increase as more renewable generation enters the market. Substantial additional investment would be required to provide the ‘ancillary services’ in other ways. Secondly, depressed wholesale prices initially mitigated the LRET consumer price impacts. However, high NEM price spikes are increasingly common as there are fewer reliable conventional generators and competition weakens. In the first quarter of 2017, prices above $5,000 per MWh occurred in 28 half-hourly trading intervals, particularly in Queensland (14), South Australia (8) and New South Wales (6). These price spikes probably reflect a thinner reserve margin due to power station closures and greater opportunities for remaining dispatchable generators to raise prices in the spot market. Consumers now face increasing subsidy payments and high wholesale market prices. Price spikes also pose a significant financial risk to electricity retailers. Greater price volatility will raise costs to customers, who ultimately pay for greater financial risks in the market. The consequences of increased renewable penetration and plant closures are further discussed in detail in ‘Appendix 1 – Impacts on the power system as renewable penetration rises’. While subsidised renewable energy created an initial energy surplus it has gradually driven unsubsidised generation assets out of the market (despite their overall costs at the time). Initial declines in wholesale prices have been replaced by dramatic increases. This has begun to flow through to retail prices. The ACCC estimates that wholesale price increases will eliminate retail price declines since 2007–08 and then add a further 22% to the wholesale component of average residential prices (2.5 c/kWh or $25/MWh), or 17% to average bills. This translates to an additional $89 per year. At current dollar values, the average residential bill will be more than $500 per year above the 2007–08 bill. This will be linked to a price increase of almost 12 c/kWh or $120/MWh. Over the past 10 years, household electricity consumption has declined by about 3 per cent on average. Electricity costs as a share of household expenditure has more than doubled in nominal terms, and increased by 65 per cent in inflation-adjusted terms. Household disconnections are increasing across all jurisdictions, as are the numbers of households experiencing payment difficulties and building up large arrears. It is more challenging to assess the impacts of electricity price increases on businesses. The issues are more complex than for consumers, as businesses vary greatly in size and energy intensity. Small business customers tend to pay per kWh prices that are similar to prices for households. For these (small) customers, and depending on the jurisdiction, the electricity component of bills (which depends on wholesale market prices and a retailing margin) makes up between 40 and 50 per cent of bills. For large, energy-intensive industrial consumers, the composition of energy bills can be quite different, and wholesale market prices make up a larger component of electricity bills. For these users, recent unprecedented increases in wholesale prices across the key NEM regions are a significant source of concern. Anecdotal evidence suggests there have been significant recent price increases for businesses. Retailer ERM Power reported a 170% price increase for electricity contract prices for commercial customers in Victoria and South Australia relative to two years ago. Manufacturers are similarly reporting a doubling or tripling of pricing offers. As at the end of July 2017, Energy Action’s Price Index suggests that the forward price of electricity for commercial and industrial customers had increased by around 30 per cent in Queensland, approximately doubled in NSW, and increased by 166 per cent and 169 per cent for large customers in Victoria and South Australia respectively. Discussion of high business power prices often focuses on energy intensive, trade-exposed industries (EITEI). Aluminium smelters are the leading example. However, smelters are not the only adversely affected operations. Energy is a substantial input for hundreds of medium-sized businesses and thousands of small businesses. Businesses will pass on higher electricity prices to consumers if they sell products or services locally but are not exposed to international competition. This will add to add to cost-of-living pressures. Businesses that export or face competition from imports will not be able to pass increased electricity costs through to consumers. Their options include: accepting lower profits, changing their cost structure by investing capital to use less energy, and reducing labour costs. Lowering labour costs will involve reducing employee numbers if wages and salaries cannot be reduced. If these measures are not sufficient to return a business to profitability, it will need to relocate some or all of its operations overseas, or simply close. This process is already underway. A decade of poor energy policy is acting like an acid on the economy, cutting Australia’s international competitiveness, and undermining the prosperity of Australian society. This decline has the potential to undermine public support for the economic reforms of the 1980s, 1990s and 2000s, dating from the Hawke-Keating governments and through the Howard-Costello government. Professors Hilmer and Banks recently expressed their concerns about the seriousness of the situation. Business is deeply concerned that rising power prices and lower reliability will affect business investment decisions and export-competitiveness. The Governor of the Reserve Bank of Australia, for example, has expressed concerns about the effects of rising electricity prices on business investment. All subsidies distort the market. They steer capital to investments that would not otherwise have been made. Far from being an exception to this rule, energy subsidies are a textbook case of gross market distortion and serious unintended consequences. Renewable energy subsidies have misallocated capital on an industrial scale. It has driven investment in generators into a market that needed no extra capacity at the time. This subsidised excess capacity drove down wholesale prices to the point where it pushed some of the then lowest cost generation off the system. The result was a deficit of dispatchable energy and a significant increase in prices. Subsidy programs like the Renewable Energy Target are chronically flawed. They fail to account for the costs associated with reliability, and the costs to consumers that arise from the erosion of reliability. They have incentivised the building of generation capacity which has undermined reliability in the National Energy Market. The majority of renewable energy subsidies in Australia are cross-subsidies between consumers, via retailers, to buttress business cases that would otherwise not stack up. They are driven by government mandates but not appear in government accounts, and do not impose the political cost that comes from raising taxes. The scale of Commonwealth-mandated subsidies is determined by the size of the RET. The larger the RET, the larger the levy on consumers, a vital piece of information seldom disclosed to the public. State-level renewable energy targets arose from interstate competition to attract investment. That investment has been driven largely by consumer cross-subsidies mandated by Federal legislation, the costs of which are spread across all customers nationally. With appendices, Tony Shepherd’s report runs to 93 pages and covers, among other things, how the National Energy Guarantee can be structured to kill off unreliable and intermittent wind and solar; re-stabilising the grid and ultimately lowering retail power costs. It also goes into the obvious benefits of nuclear power generation, demanding an end to the ludicrous ban Australian Federal and State governments have placed on nuclear power generation in this Country. There is also a detailed analysis of the cost of Commonwealth, state and territory government green schemes. 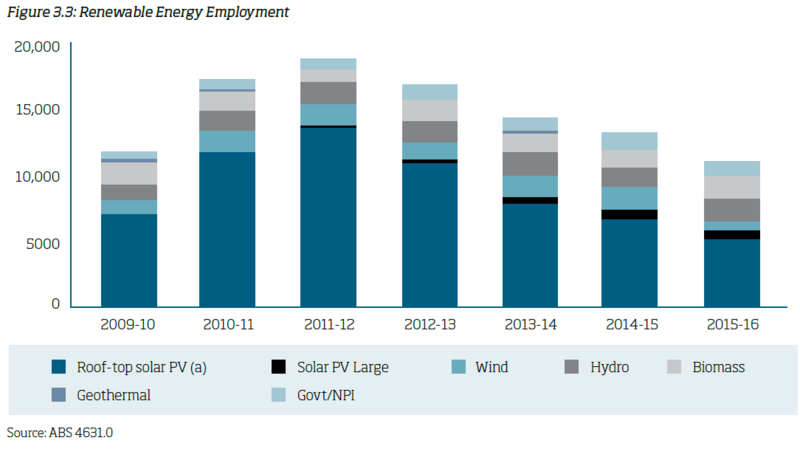 The report also contains a detailed analysis debunking claims that subsidised wind and solar have generated meaningful and lasting employment in Australia (see Figure 3.3 above): the employment generated has been dominated by the installation of solar panels on domestic rooftops; the numbers of jobs involved in that endeavour has declined rapidly since 2011 (13,000) to around 6,000 in 2016, and falling. At its peak in 2013-14 the wind industry employed a paltry 1,670 Full-Time Equivalent workers, dropping to 580 workers in 2015-16. Hardly a ‘green’ employment bonanza, despite over $3 billion a year in subsidies being thrown to the wind. Another victim of SA’s obsession with subsidised wind & solar. I have heard the stock statement answers from the premier, MOECC minister, his staff, Chatham-Kent mayor and council, municipal administration and the main owners of the North Kent wind farm that it is making me sick. Renewable energy from sewage? You couldn’t make it up. What’s next, stomach wind? It is true: Here in the UK (with three times Australia’s population) we have over 250MW of sewage sludge generation, that runs at near 50% load factor, ie similar to fossil fuel stations. I’m guessing it’s installed by the water companies to contribute to their own consumption more cheaply than the grid supply, as I’ve not heard of a subsidy scheme for it. Obviously supplies only a tiny proportion of our energy, but it helps reduce our energy imports. At what cost per MWh, including subsidies, soft loans etc, etc? As I said, there’s no subsidy or other support that I can think of. The water companies here are now commercial businesses independent of government, so the capital cost is either met out of their running finances, or raised at commercial loan rates. As I’m not in the business, I’ve no way of knowing the costs of it, or their savings by doing so. In Australia, waste gas and bio gas generators get RECs on the same terms as wind and solar. I was at a gloomy, cold but packed Adelaide Oval yesterday for the Test match. During one of the many rain delays I opened our local newspaper Saturday’s Advertiser. In a piece of propaganda spun up by some overpaid spin doctor commissioned by our hapless state govt was a two page pictorial spread of country scene with wind turbines, the Tesla battery, superimposed into it was your nuclear family in their entertainment room supposedly in perfect harmony with the environment with their power supply coming from the wind fueled big battery. “We are back in control of our energy future” was part of their snake oil salesmen spin. Then as the English supporters of the “Balmy army” broke out into chorus with “God save the queen” I thought to myself yes indeed God save the queen because nothing is going to save South Australia. Congratulations Koutsy, you have turned us into Greece.